The airline held a special event in the hangars of Hong Kong Aircraft Engineering Company Limited (HAECO) at Hong Kong International Airport to give an exclusive preview of the new arrival to aviation and trade officials, key business partners, members of the Marco Polo Club loyalty programme and guests from the Hong Kong public. Guest of Honour at the event was Joseph Lai, Permanent Secretary for Transport & Housing (Transport), who officiated at the welcome ceremony together with Cathay Pacific Chief Operating Officer Rupert Hogg. “We understand that for our passengers, sleeping well, enjoying first-class entertainment, and using products that have been designed with them in mind are of the utmost importance. The new A350 will provide the very best of all these,” Mr Hogg said. “The lower cabin pressure and noise levels combine with our new features to set passengers up for the best sleeping experience possible in the skies. We have gone all out to provide the best inflight entertainment too. All seats come with the latest high-definition touchscreen personal TVs and a greater selection of movies, TV, live news channels and music. 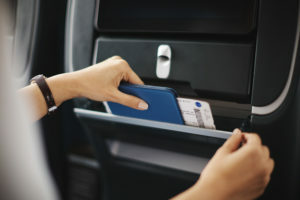 Inflight Wi-Fi is also available to connect passengers to family, work and world events, if they choose. We could not be more excited with what we’ve seen so far of the A350, and I’m sure that our passengers will feel the same way once they step on board. The 6-way headrest is a proprietary design that provides better support and enhances sleeping comfort. The features of Cathay Pacific’s new A350-900 take the passenger travel experience to a new level. The design of many of the cabin features has been carefully considered to give passengers the best sleeping experience, the best entertainment, and to offer them greater control over how they want to use the space, whether for working or to relax. With its extra wide body, the aircraft offers more space and comfort. The A350 is designed for the wellbeing of passengers; the quiet cabin, panoramic windows, LED mood lighting and huge overhead lockers all contribute to a more comfortable and relaxing journey in all cabin classes. 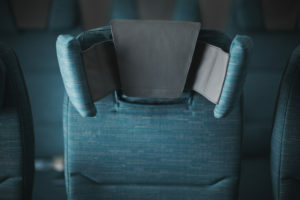 The A350 Business Class seats build on the success of Cathay Pacific’s award-winning long-haul Business Class product to create a truly memorable experience. Alongside a fully flat bed, new features include extra stowage space within easy reach and the personal service offered by a “Do Not Disturb” and “Wake Up Call” function in the entertainment system. Dedicated tablet holders that make it easy for passengers to enjoy entertainment content on their own devices. The new A350 inflight entertainment system is inspired by the airline’s latest design philosophy. The interactive user interface is contemporary and fresh looking. It is equipped with notable new interactive features which broaden the inflight entertainment options for passengers along with a wider screen in all classes. 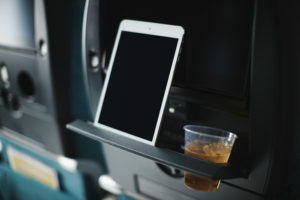 Connectivity is installed for the first time in a Cathay Pacific aircraft, allowing passengers, for a fee, to browse the internet, send and receive emails and connect on social media. Access to the Cathay Pacific website, a number of partner websites and three live TV news channels is available free of charge. The newly delivered A350-900XWB employs innovative technology and design which improves not only passenger comfort but also the efficiency, effectiveness and overall performance of the aircraft. Its state-of-the-art design, together with the latest generation of engines and the use of advanced construction materials – including carbon fibre composites – deliver a 25% improvement in operating costs overall when compared to previous-generation aircraft. Powered by the latest technology Rolls-Royce Trent XWB engines, the A350 is the quietest among the aircraft types in its class and also 25% more fuel efficient. As part of the Cathay Pacific Group’s ongoing support for the commercialisation of sustainable aviation biofuels, all the airline’s A350-900 aircraft – including the first delivery – are being flown from Toulouse using fuel containing a 10% blend of biofuel. 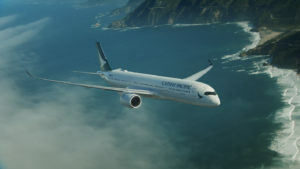 Cathay Pacific aims to build on the advantages offered by the A350 to further expand its global connectivity by operating more flights to more destinations throughout its network. This will provide passengers with a wider range of travel choices, at the same time as strengthening Hong Kong’s position as a key international aviation hub. Cathay Pacific’s first A350-900 will enter into service on 1 June with a turnaround flight to Manila. It will operate mainly on regional destinations until more A350s arrive, and the aircraft will be deployed on various long-haul routes – including London Gatwick and Düsseldorf – from the third quarter of 2016.